In the early part of the fourth century, a few Christians, mostly men and some women, began to withdraw from "the world" to retreat into the desert, there to practice their new religion more seriously. The person who aspired to "renounce the world" first had to find an "elder," a person who would accept him as a disciple and apprentice. To his elder (whom he would address as abba—father) the neophyte owed complete obedience; from his abba, he would receive provisions (as it were) for the road to virtue. 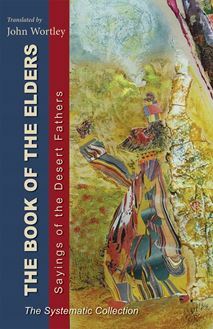 In addition to the abba's own example of living, there was the verbal teaching of the elders in sayings and tales, setting out the theory and practice of the eremitic life. In due course, these sayings (or apophthegmata) were written down and, later, collected and codified. The earliest attempts to codify tales and sayings are now lost. As the collection grew, they were first organized alphabetically, according to the name of the abba who spoke them, in a major collection known as the Apophthegmata Patrum Alphabetica. A supplementary collection, the Anonymous Apophthegmata, followed. Later, both collections were combined and arranged systematically rather than alphabetically. This collection was created sometime between 500 and 575 and later went through a couple of major revisions, the second of which appeared sometime before 970. This second revision was published in an excellent new critical edition, with a French translation, in 1993. Now, in The Book of the Elders, John Wortley offers an English translation of this collection, based entirely on the Greek of that text.